The Performing Arts BC Provincial Festival was held in Fort St. John from May 31 to June 4 and was a resounding success. More than 400 delegates from across the province entertained and amazed audiences with talent and skill that had to be seen to be believed. Ten different venues, including many local churches, opened their doors to BC’s best young performers in Music, Dance and Speech Arts. Out of town visitors spoke highly of the friendliness and helpfulness of the local volunteers and businesses during their stay in the Energetic City. Many residents opened their home to music performers who needed practice pianos and a number of restaurants and other businesses offered discounts along with a warm welcome to festival participants and their families. Well done Fort St. John! The Festival was made possible by a small army of volunteers and with the support of local sponsors. 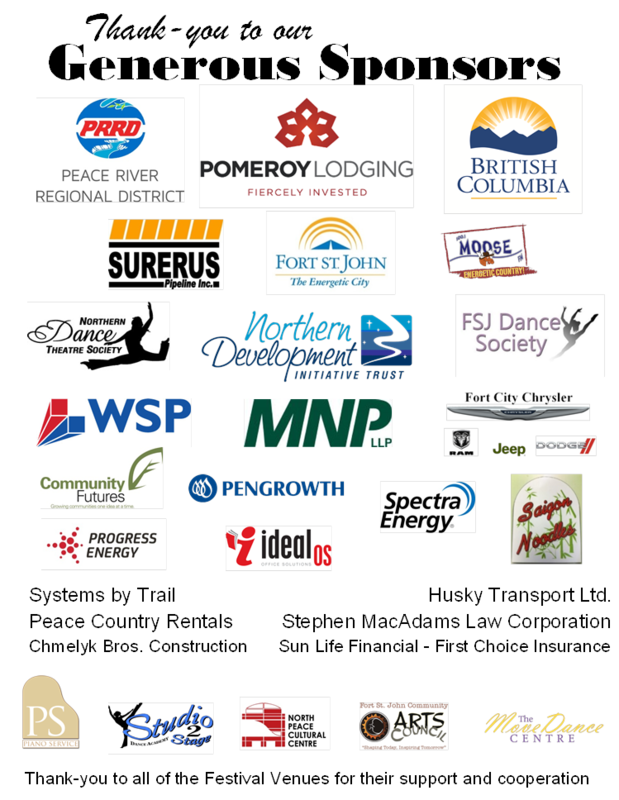 The Organizing Committee is grateful for all of the community support whichout which staging such a large event would not have been possible.